Anyone looking to get a job working at Sandwell, City or Rowley Regis Hospitals or who wants to find out more about a career in healthcare can find out more at a new centre which was officially opened in Smethwick today (Monday March 25). Local people are invited to drop into The Learning Works or give staff a call to find out about the opportunities that are available which range from sprucing up your CV and interview techniques to finding out more about current job vacancies. Staff at the centre are dedicated to helping local people access employment in the health sector via a range of work experience, apprenticeship, volunteering and adult learning opportunities. The Learning Works is run by Sandwell and West Birmingham Hospitals NHS Trust – it is a partnership project that has been set up in collaboration with Sandwell Council, Jobcentre Plus, Soho & Victoria Friends & Neighbours Group and the Think Local Team. It is based in the former Sandwell Council Neighbourhood Office in Unett Street and has been providing support to members of the community and career development advice to staff who work at Sandwell and West Birmingham Hospitals NHS Trust since before Christmas. The location was deliberately chosen for its place in the heart of the community but also for its proximity to the site of the new Midland Metropolitan Hospital site, which it is hoped will also bring with it further employment opportunities for local people when construction begins. 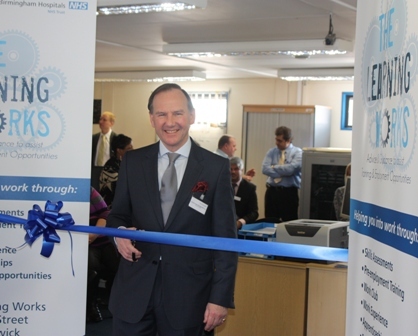 Richard Samuda, Chairman of SWBH NHS Trust, cut the ribbon to officially declare the centre open, today. SWBH Chief Nurse Rachel Overfield, who spearheaded the idea to create a learning centre within the local community to help local people access jobs at the Trust, said: “We are among the first Trust’s in the country to set up this type of centre outside our hospital site. Jim Pollitt, Head of Learning and Development at SWBH, said he hoped many people from the local area would take up the opportunities offered by the Learning Works. He said: “Our aim is to engage with our staff and local communities to promote careers within the NHS. Lawrence Kelly, the centre’s co-ordinator, said: “Through The Learning Works we are offering alternative entry routes into the NHS such as Apprenticeships and work experience placements and providing pre-employment training for locally unemployed people. For more information drop into The Learning Works , Unett Street, Smethwick or call: 07528 969809. The centre is open between 10-3pm Monday to Friday.